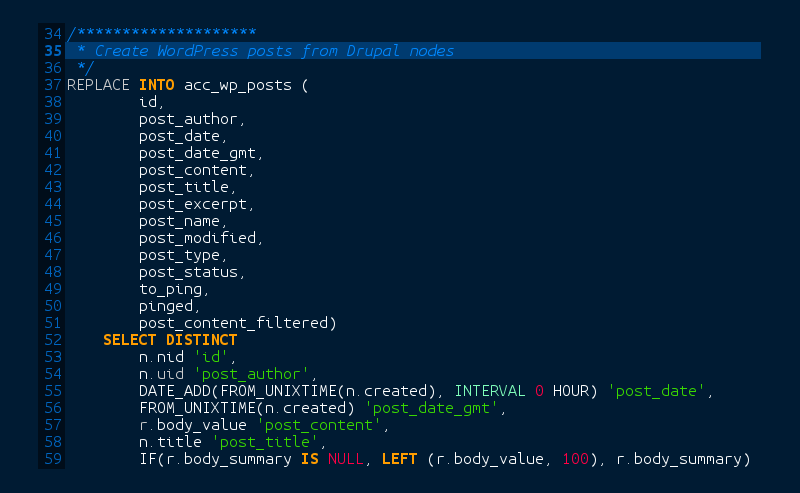 Why is the Drupal term_node table missing? In a Drupal to WordPress migration post by Sam Michel, reader Jean-Philippe commented that why he couldn’t find the tables mentioned. I started composing my reply but for some reason the page wouldn’t let me post. Rather than waste the time it took to compose the reply, I thought it would be good to post it here instead. This probably isn’t relevant to you anymore but I’m posting this for the benefit of anyone else who stumbles across your comment. The tables names have changed in Drupal 7. 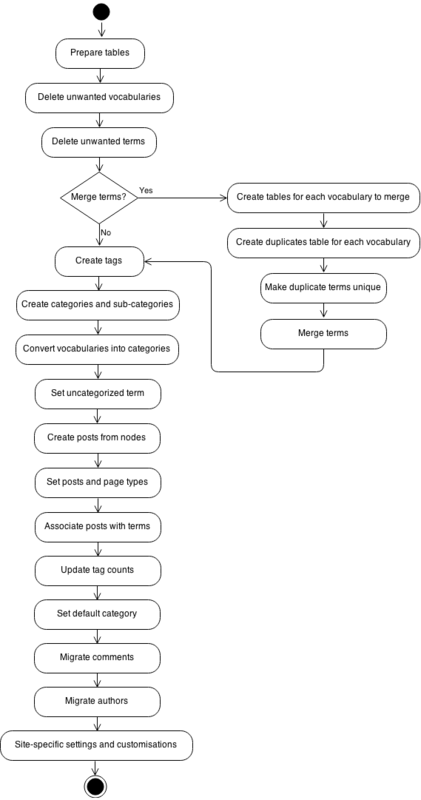 ‘taxonomy_term_data’ and ‘taxonomy_term_hierarchy’ are all Drupal 7 tables. If you don’t see the tables mentioned in this post, it’s almost certainly because you don’t have Drupal 6 installed. In Drupal 7, ‘term_node’ has been replaced with ‘taxonomy_index’. Q: What do you need to get started with migrating a site from Drupal to WordPress? The minimum requirement is some sort of access to your Drupal database. For security, we’d prefer not have access to your live servers so a compressed MySQL database dump file of your Drupal site is ideal. If you have no-one to create the database dump file, we can create one on your behalf by logging in to your MySQL control panel or database server. In the cases of large databases, we’d need to work directly on your server since transferring dump files of many gigabytes is impractical. A good practice would then be to clone the database and give us a separate login to the server. That way we won’t have to touch your live server and data. An admin login to the Drupal control panel on a clone of your site would be useful for fine-tuning and debugging. This is normally not necessary for the first test export. We generally take care of setting up the entire development environment on our servers. This includes creating an empty WordPress site for displaying results and for some complex migrations, a clone of your Drupal site for analysis. If you have limited budget, you can save on fees by providing us with the development environment set up and ready to use. Q: How much will it cost to migrate my site from Drupal to WordPress? Please see my dedicated migration site for the latest pricing. Since there are so many variations between Drupal installations, it’s not practical to give reliable cost and time estimates from the outset. We really only start to understand the scope of the work after running the first few exports. Furthermore, the modules installed during the life of your Drupal site may have altered the structure of the database. This affects how cleanly we can run the migration and how many adjustments will be necessary. Nevertheless, you remain the driver of how much work we put in. Some site owners request lots of adjustments while others are happy to have just a few aspects of their old site migrated. The biggest factor affecting the budget is therefore the amount of communication needed with regard to the adjustments. For the bottom-end migration, all we need to do is run through our migration script. You take care of everything else, including setting up the development server. We charge more if you have very rigid requirements which involve writing lots of code to automate tasks. Read more about our migration process and how it may affect your budget. Q: What is your process for Drupal to WordPress migrations? The whole migration process is very much an iterative process of fine tuning until you’re satisfied with the end result. We call each iteration a ‘pass’ because we pass through the database with our migration script repeatedly, making slight adjustments as we gather more information. You let us know how much more fine-tuning is needed. So for example, we’d run through the first pass and ask you to take a look at the content. You let us know if you discover any issues, like missing posts or meta information (e.g. tags, authors and dates). We then adjust the migration script and run another pass. This repetition continues until you decide it’s good enough. Why would there be missing information? The number and type of modules you’ve installed during the life of your Drupal site could have effected the structure of the database. This then affects how cleanly we can run each pass of the migration. For example, one client installed a module that ended up silently duplicating certain tags. We had to write custom code to remove duplicates and merge the associated posts. All of this took a great deal of time. There’s rarely a ‘perfect’ migration due to the differences between the how Drupal and WordPress store the data for your site. Often, ‘good enough’ is a compromise between your budget and how close the WordPress version is compared to the original site. It’s not always possible to get an exact copy in WordPress, especially for more complex Drupal installations. In fact, it’s usually too expensive to be overly specific about what gets migrated over because we’d write code and debug custom rules. We generally recommend bulk migration of only the aspects that would be tedious to do manually, then getting a human editor to ‘eyeball’ the content to make very specific changes using the WordPress user interface. It’s a boring job for the content editor but it tends to be cheaper and more accurate way of polishing off the migration.